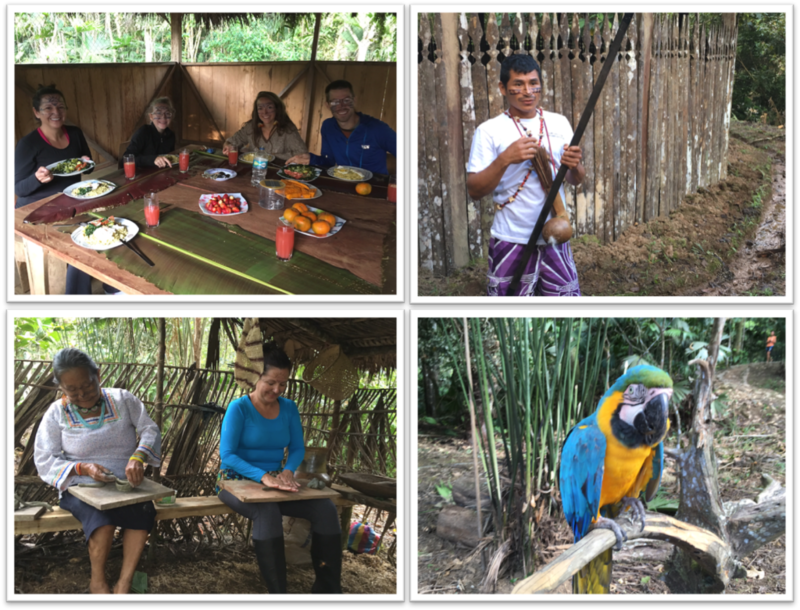 A group of 7 Las Olas owners/friends headed to the Ecuadorian Amazon a few weeks ago to visit the Kichwa community of San Virgilio in the Pastaza province. This community, located about an hour’s drive from the city of Puyo, welcomes small groups of visitors looking to learn more about the traditions of the Kichwa culture and share a few days with them in the village. Next month, we will also talk to you about the involvement of Las Olas with this community, and how we are looking to help the women of San Virgilio increase their revenues from their crafts and artwork. Before building the road that provides access to the community of San Virgilio (a hectic 45 minute drive in a 4×4 pick up) the citizens of the village had to walk a hilly 4 hours (and believe us, they walk much faster than you and I!) just to get to the nearest road, from which another 35-minute drive would bring them to the city of Puyo. Once we arrived at the end of this road, we still had to walk 20 minutes down a hill, before crossing a river three times and finally reaching the camp where they receive visitors. No, you can’t go directly to the village, as they do not allow “bad spirits” to come in. You first need to get a “limpia” (a cleanse) and if you have a pure soul, you might get invited to visit the village. That said, we were greeted with drums and smiles while walking to our camp. Once we reached the community hut, they painted our faces with a specific mashed fruit… and it’s only after being painted that they told us the “tattoo” will take 8 days to disappear! The little homes we slept in were rustic but comfortable. If you want to visit the Amazon, we would recommend doing it during the dry season, which we did. Even then, we experienced a few showers and the trails become muddy quickly so rubber boots are a must! We were expecting a lot of bugs, but again, we were happily surprised with the fact that there were not a lot. We had the chance to taste amazing food (all organic!!) and learned how they prepare Chicha, a traditional drink that they prepare by fermenting mashed yucca. During the afternoon, they showed us how they hunt with a blowgun. We were “blew” out by the experience and most of us were able to shoot a dart within a few inches of the target from about 50 feet. Of course, the hunter who did the presentation easily hit the middle of the plant we were aiming at! We participated in a traditional ceremony with music and dance and realized how festive these people are. We learned how to do pottery and saw some amazing birds. The strongest moment of our trip occurred one evening when the Shaman drank Ayahuasca. According to their tradition, drinking Ayahuasca allows the Shaman to access “another level” and thus helping us to remove bad spirits and thoughts from our body and soul. That moment, performed in absolute darkness, is our most unforgettable and very intense souvenir we took away from our trip to the Amazon.